Egyptians Prepare For Historic Presidential Vote More than a year after its revolution, Egypt votes for a new president on Wednesday and Thursday. The race is wide open and none of the 12 candidates is expected to get an outright majority. If those forecasts prove true, a runoff will take place next month between the two top vote-getters. An Egyptian woman walks under a campaign banner in Cairo on Tuesday. Egypt holds its first competitive presidential election on Wednesday and Thursday, with a dozen candidates in the race. The first free presidential election in Egypt begins Wednesday. Twelve candidates are running for the top spot vacated by Hosni Mubarak during last year's revolution. But none is expected to get an outright majority, and if that proves true, then a runoff will take place next month between the two leading vote-getters. Many Egyptian voters say they are excited about the presidential election, which the country's ruling generals promise will be fair. Egyptian State TV is playing patriotic songs and showing photographs of the revolution to encourage the country's 51 million voters to take part in the vote. Candidates: There are 12 candidates and no clear-cut favorite. Perhaps the best-known figure is Amr Moussa, a prominent official during Hosni Mubarak's long rule. If no candidate wins a majority, then a runoff election between the top two will be held in mid-June. Presidential Power: Egypt is working on a new constitution and it's not clear how much power the president will have. However, the president is unlikely to have the sweeping authority that Mubarak and earlier Egyptian presidents had. Military's Role: The military is expected to maintain a prominent role and one of the big challenges Egypt faces is balancing power between the president, the parliament, the military and other groups. On their Facebook page, the ruling generals describe the vote as the only way to guarantee Egypt's future stability and development. And if that isn't enough incentive, officials are threatening to fine registered voters $16 if they don't cast ballots. That's a significant sum for most Egyptians. Yet some Egyptians who played a role in the revolution say they won't be voting. Activist Sarah Hawas, a 24-year-old film researcher who was involved in some of the protests that ousted Mubarak, dismisses the vote as a ploy by the military junta to look democratic. "It's extremely difficult for anyone that has been struggling in this revolution from day one to trust — even superficially — that these elections mean anything but a referendum for continued military control," she says. Hawas says no election should be held while the generals engage in undemocratic behavior. She points to thousands of civilians who've been arrested and referred to military trials without due process, as well as recent violent attacks on protesters. "I don't think that given the present condition, that any president — no matter how close to the revolution — will have much sway at ending the state of affairs," she says. Egyptians who plan to cast ballots were more optimistic. They include Mohammed Abdel Azim, who was in Tahrir Square, the epicenter of last year's revolution. The 30-year-old who does interior design work says he's happy because he will finally have a say in who runs his country. Despite the mixed feelings, turnout is expected to be heavy when the polls open across Egypt at 8 a.m.
"Most of the Egyptians believe this is a turning point," says Hassan Abu Taleb, a consultant for the state-funded al-Ahram Center for Political and Strategic Studies. "Maybe it will open a window — a small window — for democratization, for economic achievement, for security and stability." 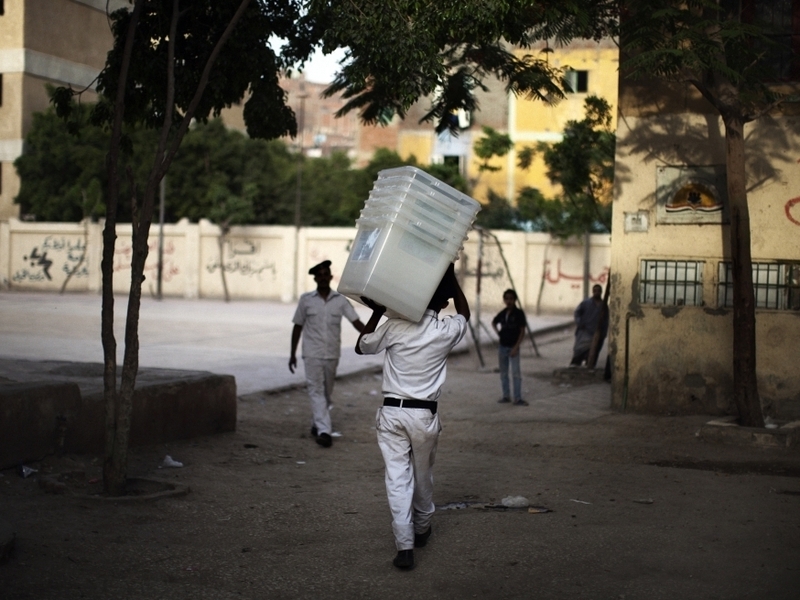 A police officer carries empty ballot boxes to a polling station in Cairo. Turnout is expected to be heavy. There will be international monitors, including a U.S. group headed by former President Jimmy Carter. Egyptian election officials say that to prevent tampering during the count, they are using improved ballots with serial numbers and transparent ballot boxes with multiple seals. It's unclear which candidate will come out on top given the conflicting opinion polls. The top contenders are believed to be two former Mubarak-era officials and two Islamists who are bitter rivals. One of the Islamists is a former leader of the Muslim Brotherhood and the other is the group's current leader. The Brotherhood's political party easily won the most seats in parliamentary elections held in December and January. All of the presidential candidates are far older than the young people who spearheaded the revolution. If no one gets more than 50 percent of the vote, the two top winners will take part in a runoff in mid-June. But who wins is not as important as what follows, says Khaled Fahmy, who heads the history department at the American University in Cairo. "I personally don't think that this presidency, this election counts for that much," he says. "This president, and I suspect the parliament, will not last for long." He and other analysts say it will be the contest over who gets to draft the new constitution that Egyptians should be paying attention to. The ruling generals say they plan to revise the document without voter approval, a move some fear will enshrine their power. The changes are expected to limit civilian oversight of the armed forces. The changes will also give the military a say in the country's key policies even after the generals step down.